Watch the 2013 Portland Marathon (Oct 6), dubbed “the best people’s marathon in the West.” Or wind your way through decorated woods along the Halloween Fantasy Trail (Oct 1–30), complete with plenty of pumpkins and a family-friendly castle. 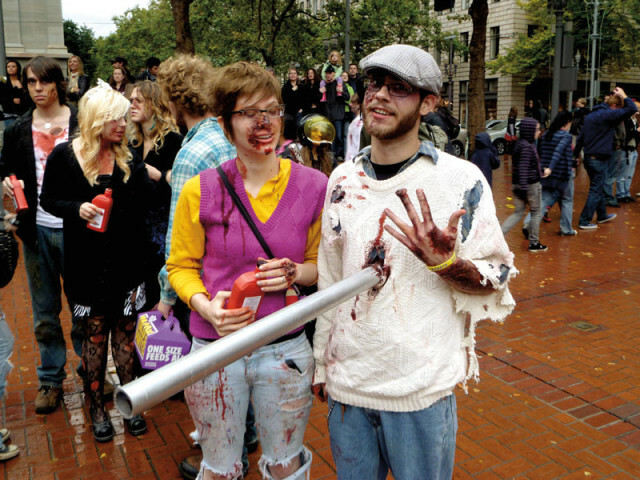 For an easier pace, shuffle down to the eighth annual ← Portland Zombie Walk (Oct 13), and join 3,000 “undead” roaming our streets. Head indoors for our annual reminder that print, too, is undead. The Wordstock Festival (Oct 3–6) features lectures, readings, and panels by more than 150 authors. NW Film Center’s Reel Music Film Festival celebrates the interplay between sound and cinema (Oct 11–24). Cheer on the Portland Winterhawks as they take on their perennial rivals from Seattle (Oct 20). Delight your inner 8-year-old at the Portland Retro Gaming Expo (Oct 5–6) with classics like Pac-Man, Tron, and Donkey Kong. Ogle the best (and worst?) local skin art at the Portland Tattoo Expo (Oct 11–13). Bring your partner to Committed! Portland’s Indie & Alternative Wedding Event (Oct 11), where brides and grooms (in all combinations) learn to throw a wedding while keeping it weird.